A few weeks ago after ntel increased its unlimited plan price to N17500 without prior notice to her subscriber. Initially, they started with N10,000 to N12500 and now N17,500. Though subscribers were not happy and some threatened to port beginning from 2018 to other reliable networks. Ntel took to their social media handle earlier to announce a new unlimited night plan to their subscribers. One thing noted as from the advertisement is that it looks truly unlimited without any form of throttling. 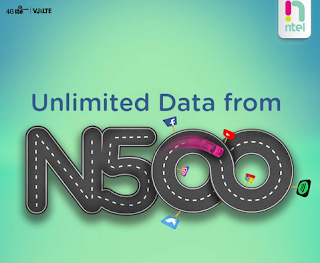 N5000 Unlimited U from 10pm – 6am validity period is 30 days. If you have anything heavy (very heavy) to download or stream.. you can go with any of the plans. From their social media handle, they said this offer expires March 4, 2018. Visit http://www. ntel. com. ng/night-plans/ for more info.